Chögyam Trungpa describes "crazy wisdom" as an innocent state of mind thathas the quality of early morning--fresh, sparkling, and completely awake. 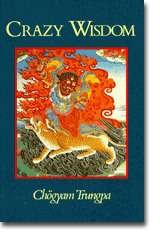 This fascinating book examines the life of Padmasambhava--the revered Indian teacher who brought Buddhism to Tibet--to illustrate the principle of crazy wisdom. From this profound point of view, spiritual practice does not provide comfortable answers to pain or confusion. On the contrary, painful emotions can be appreciated as a challenging opportunity for new discovery. In particular, the author discusses meditation as a practical way to uncover one's own innate wisdom.